1. How do you feel about "Gladiator" sandals, also called "Roman" or "Jesus" sandals? A fashion yea or nay? They are not for me, I don't wear anything quite that flat, but I have seen them on ladies and think they are cute with the right outfit. 2. What is your favorite pizza? Sweep The Kitchen We have a locally franchised pizza place here called "Johnny's Pizza" and they have some of the best pizza on the market. We don't indulge very often, but when we do, it is a real treat! 5. What is your current favorite snack? I love salty snacks and guess if I could or would allow myself to, I would snack on potato chips all day long. I'd just leave a bag open on the counter and every time I walked by, I'd grab a handful. Thank goodness I have will power over that or I would be in trouble! 6. Hypothetical: You are required to be a reality show contestant. Which show would you choose based on your probability of success? (You cannot choose "none.") Well, of these 3 it would have to be Dancing with the Stars. Now, do know that I have "two left feet" so it would be a real challenge to say the very least. But, I would give it my best shot and be assured that my outfit would FULLY cover me. I personally think that there should be rules about just how much the contestants can reveal of their bodies. Some of them leave nothing to the imagination. 8. It doesn't feel like Spring until I am wearing flip flops and have our patio is all decked out with plants. 9. Something that made you laugh really hard recently is I spent a few days last week in Virginia and spent some time with a cousin that is just so funny and full of "one liners." As usual I can't recall one at this moment, but we laughed and laughed and so enjoyed our time together. I can never laugh enough, I love it! 10. Tell me about a goal you're working toward. What a great question and I am ashamed to say that I am not sure about that and that is sad! I think we should always have goals, they help to keep us on track. I will ponder this today! 11. Share a thought-provoking or inspiring quote this week. "Nothing is Worth More than This Moment"
Mine and their Dad's encouragement and approval is probably the things that make our children happiest. This has always been a top priority for us as parents and we continue with it even now that they are grown and have children of their own. 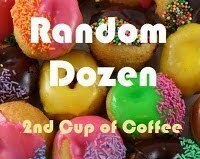 For more Random Dozen check out Linda's Second Cup of Coffee. Linda brings us so much fun on Wednesday's with her questions and we salute her for taking time to do this for us! I wish I had your kind of will power! I used to, but I seem to have lost it lately. I'm working on it though! ~ I think you might be appalled if you saw my car! Yikes!